You can now get your message across anywhere inside of your school!We know the importance of designing durable, long-lasting message boards. How about one that you can move around anywhere inside of your school? 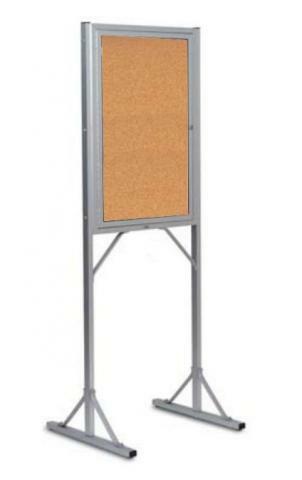 We offer the Free Standing Cork Board to give you the flexibility to get your messages across in front of the main office, next to a particular classroom, or outside by the main entrance. The heavy duty steel base on the Free Standing Cork Board prevents the board from falling over. Yet, the board is light enough for you to carry to other strategic parts of your school. The acrylic glass door protects any announcements or notices that you place inside of the Free Standing Cork Board. Plenty of room is provided to post news about upcoming events or locations of special events occurring inside of the school. Free Standing Cork Board is easy to see from afar, giving it prominence over other information outlets. The maintenance free satin-anodized aluminum trim provides extra durability to the resilient cork surface.